I really like the latest developments in the online education/learning field. Some of the startups are really creative and changing the traditional boring means to learn with more fun, gamified, self-learning online resources. On these sites, you will not only be able to learn, but also contribute to the community if you are good in certain subject fields. This is a great way to harness the benefits of crowdsourcing. 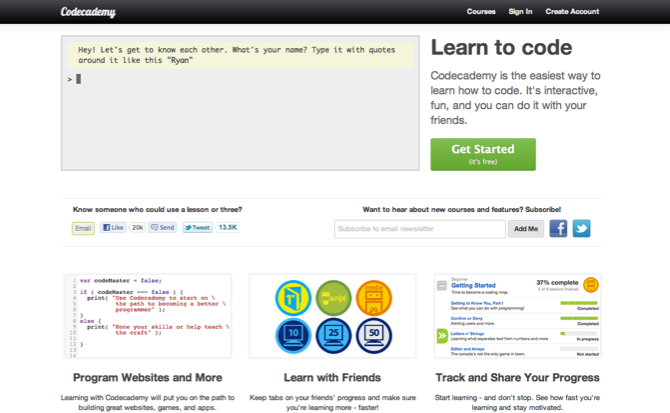 Codecademy is an interactive and fun way to learn coding. By asking you to type set of words and answers to questions, it will involve you in a two-way communication. By the time you realize, you will be coding and understanding the concepts of object oriented programming. It also employs social elements to the site, so that you can learn together with your friends. 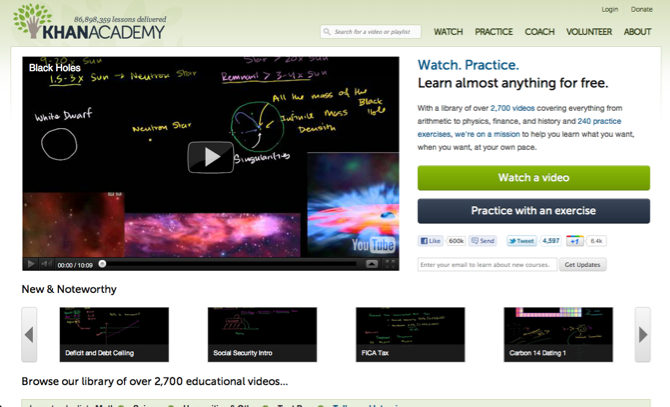 Khan Academy has a huge collection of 2700+ free videos. And it’s a work of one man, Salman Khan. What started of as a casual online tutoring sessions for his relative’s kids, turned out to be one of the largest non-profit educational organizations in the world. He has MBA from Harvard, he has three degrees from MIT: a BS in math and a BS and a master’s in electrical engineering and computer science. His website is mainly popular for his maths videos, which are easy to understand and appealing to school kids. You can read more on Khan’s story at the following sites; Money.CNN, Wired, and SiliconPrairieNews. 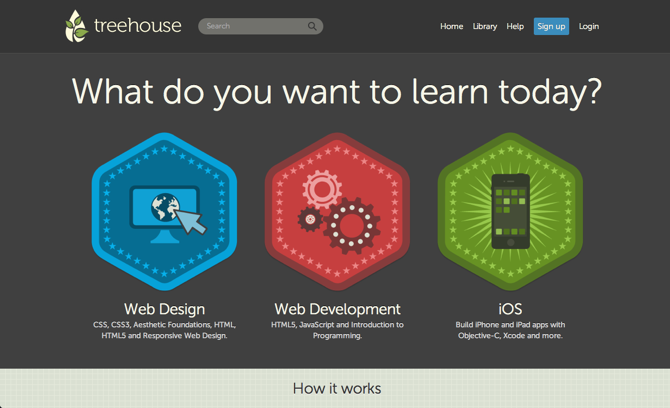 Treehouse is a fairly new website that concentrates on providing instructional videos on Web Design, Web Development and iOS Development. As a part of its teaching method, it uses ‘badges’ similar to what FourSquare does, you will get a badge for answering questions correctly. However, unlike CodeAcademy and KhanAcademy, Treehouse charges for its service, starting $25/month. The project is backed by one of the well known investors, namely; Reid Hoffman, Kevin Rose, David Sze, Chamath Palihapitiya and Mark Suster. Veri is a veri good website 🙂 It’s a community managed website that have a wide range of topics, from online marketing to understanding term sheets to parenthood. Yeah that’s how wide their array of topics are. Teaching method employed at Veri is multiple choice based questions, if you answer the question wrongly, you can learn the right answer. You can also invite your twitter and FB friends and see their progress and classes that they are taking. You can also create your own lessons or contribute new modules to the existing topics. Last but not least, Code School is a paid service ($25/month) that teaches variety of programming and web design subjects. Their teaching method combine video, coding in the browser, and gamification principles to make learning more fun and therefore more effective. There is a selection of free courses that you can take. I hope you liked the resources. Do you know of any other resources that are making a difference in online education/learning? If you do, please plug them in the comments section. Skillshare.com – marketplace for teaching and learning. Find people to teach or learn from. All classes happen in real life/offline. Udemy.com – create your own video lessons, take courses from others. Programr.com – learn tons of programming languages. CourseHero.com – website that collects education related videos from youtube and arranges/categorizes in different subjects, making them a course for you to take and follow thru. Coursera.org – Coursera is an education company that partners with the top universities and organizations in the world to offer courses online for anyone to take, for free. mySlideRule.com – Slide Rule aggregates online courses and allows users to search based on course name, start date, difficulty level etc. coursmos.com – Find the micro-courses you want and start your education today. www.edx.org – Take great online courses from the world’s best universities. gohighbrow.com – Subscription service that brings cool and exciting bite-sized daily courses to your inbox. 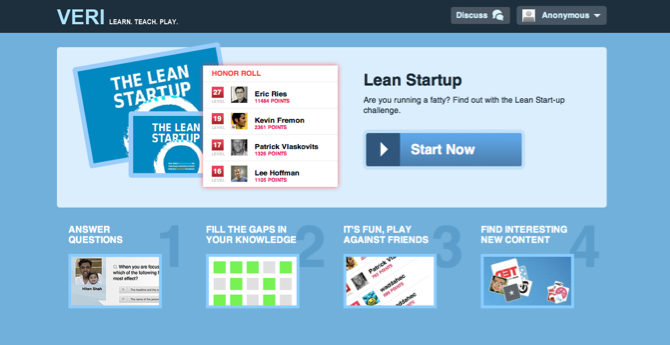 stuk.io – Learn how to code from scratch. courses.platzi.com – Live streaming and recorded classes on design, marketing and code. 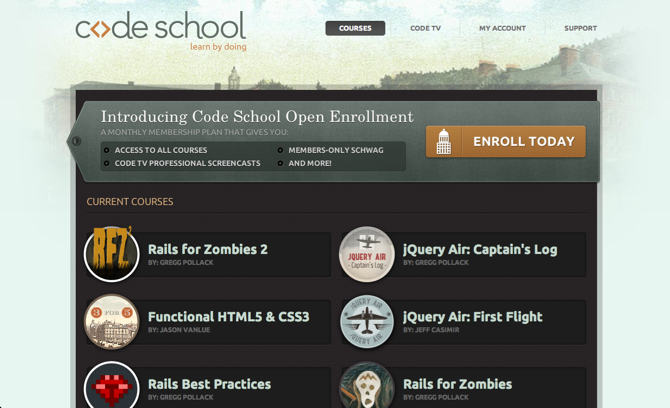 learnable.com – Web Development courses on subscription basis. code.org/learn – Suitable for kids and beginners. www.dataquest.io – Learn Data Science for free. datamonkey.pro – Learn SQL and Excel for Data Analysis interactively with concrete examples and full immersion into the work environment. dash.generalassemb.ly – Learn how to make websites. www.duolingo.com – Learn another language for free. www.memrise.com – Learn any language with joy. study.com – Prepare for tests, improve your school grades, study for certain subjects. https://getmimo.com/ – mimo is an app that teaches coding in an interactive way.